Potatoes seem to be the one food that's a hit or miss for me. 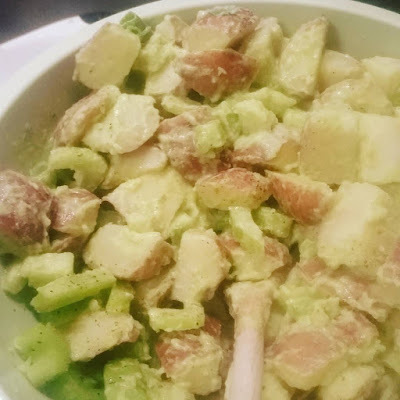 I'll have the occasional potato salad at a Summer BBQ and of course mashed potatoes with gravy or sweet potatoes during Holiday time, but I rarely cook them myself. If my mom makes a roast chicken or roast beef and serves mashed potatoes with them, of course I'll eat it. I actually love potatoes, they are just not my go to. I have been trying to cook different meals more recently and become inspired from different magazines and food blogs. What's even better, I have been trying to stick to the meal I have written down on the weekly menu and still cook it even if I am tired from a long day and would prefer to order a pizza. That's just too easy sometimes. So one night I wanted it to be burger night because yum. My husband would grill the cheeseburgers and I would make the potato salad. I was not in the mood to make it at all but it came together so quickly. I also didn't want a fat-laden potato salad with mayo in it and I was not going to buy a store bought container of potato salad. Besides washing the potatoes and chopping them up, they came to a boil rather quickly, were super tender and the herb dressing was a breeze to make and so, so good. I also love making stuff like this because you can have leftovers of it for lunch! You're going to love this recipe! I think next time I might add chopped, crispy bacon to it. That might put it over the top!